Linking with Small Things to show what I’m doing albeit slowly. I hear ‘yarn along’ and I think I always take my yarn along. Most places I go I have some kind of project to work on. I’ve even knit at stop lights. This is “The Wonderful Wallaby” by Cottage Creations. 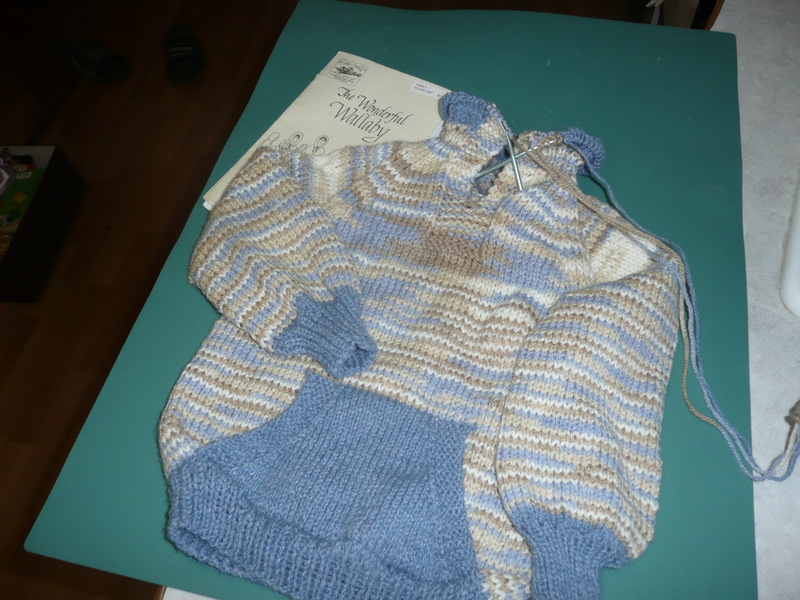 I’s like a sweat shirt knit from the bottom up, only seaming is at the top of the hood and a few stitches under the arms. So easy! My grandsons love them. Usually I make the sweater all one color, thought I’d try accents this time. January 4 – Yarn Along– I pictured a shawl, it’s still on the needles, if I could only get past row 84 with a correct count! I finished listening to The Forgotten Garden, I enjoyed it and since it is from Audible and on my Itunes list, I will listen to it again. It’s a story that jumps back and forth from 1900-1913 to 2007 a mystery of a little girl found and kept……..and finding her history.